NHRA Pro Stock Motorcycle standout Chip Ellis received the tragic news that his grandfather Hubert Ellis had been murdered during a robbery in his Aiken, SC home on May 3rd. Cycledrag.com sends its deepest sympathy to Chip and the entire Ellis family during this difficult time. 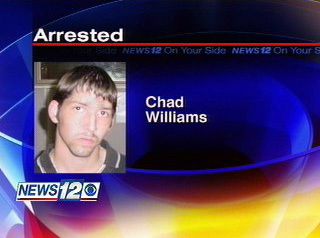 The Aiken County Sheriff’s Office has arrested 21-year-old Chad Williams. Deputies say he’s the man who killed 81-year-old Hubert Ellis. Ellis was found by his son-in-law, beaten to death inside his home at 145 Duckwood Lane, just off Old Camp Long Road near I-20. The Ellis family is still in shock. While they were too devastated to talk to us on camera, they told us they believed it was someone the 81-year-old probably knew. Now they’ve learned they were right all along. Aiken County investigators spent the last day in the area, searching for evidence that would link 21-year-old Chad Williams to his neighbor’s death. Investigators say Williams beat 81-year-old Hubert Ellis so badly, Ellis bled to death in his own home. “It’s really sad,” said Ellis’ friend and neighbor, Henry Perkins. Police say Ellis’ son-in-law came to the house yesterday morning to help Ellis do some work on the shed next to the house. But when he got there, they say he found Ellis’ body facedown on the bathroom floor. “It was just shocking,” Perkins said. Investigators say Williams came to the sheriff’s office today voluntarily to help with the investigation, and later learned he was the one responsible. Ellis’ wallet and cell phone were found missing from the home. Perkins says Ellis paid Williams to do odd jobs around the house, including painting the shed. “He was helping other people who didn’t have work, paying them to help them out, and this is what he gets for being too nice?” Perkins said. Joanne Sawyer lives across the street from Ellis. She says she moved to the area because it was safe…but now she’s having second thoughts. “I’m beginning to think it’s not safe anywhere,” she said. The sheriff’s office also tells me they believe Williams got in through the back door of the mobile home. Williams is being charged with murder and armed robbery. He’s being held at the Aiken County Detention Center.